The 2015 Arctic Cat ZR 6000 RR delivers on the promise of racing coolness, but it also has trail manners. How to prep a sled for extreme cold riding. A full-season report on the Ski-Doo Renegade X 800R E-TEC. 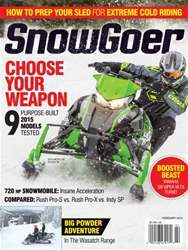 Comparing three 2015 800cc Polaris models to find out where each one shines, and details about a 720 hp snowmobile!